We have already announced on Facebook that a new book would appear on the market soon. The time has come. As I promised, this is a hot review of the pre-printed copy I got from the author. If you prepare for any English exam, sooner or later, you must do some pre-exam tests. Not only to test your level of knowledge and your readiness in general. First of all, you must familiarize with the type of exercises you will be asked to do during the actual exam. The same concerns military English exams. Each country developed its own examination models and they are standard ones, that means you can have a look at the earlier exam editions and learn what to expect when your moment arrives. But where can you find the previous exams? The answer was here, on my website. From 2012 I have been trying to fill in the gap, providing English resources for both, students and teachers, but since February 2017 you can reach for another source of knowledge too. This year a new book appeared on the market. It is “Speaking And Writing Expert. 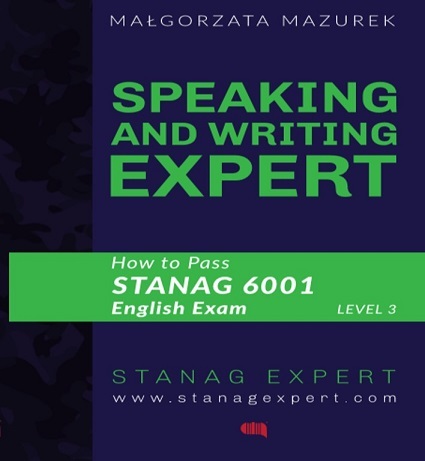 How to Pass STANAG 6001 English Exam LEVEL 3” by Małgorzata Mazurek – a Polish English teacher working for the military school of foreign languages in Warsaw. She devoted several years of her professional career to teach military students English. The book is the natural consequence of the scarcity of the resources on the market and her answer to the problem. Let’s have a look at what you can get once you decide to buy it. The first striking thing you notice is the content dealing with two language skills only (out of four required at the exam). It is not a coincidence. The two skills are so called ‘productive skills’ that fully depend on your own inborn capabilities and effort you had put into studying. The remaining two, the passive skills (of reading and listening) are harder to practise and difficult to teach. 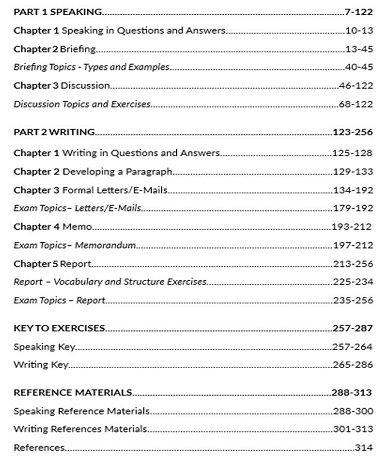 That is why you will find a comprehensive summary of the speaking and writing tasks, but no clue about the rest of tasks required for the reading, or listening parts of the exam. The second thing I liked in particular is the fact that the book is not only informative; it is actually a workbook containing multiple exercises you can do on book pages. That way you will enhance your theoretical knowledge and improve your practical skills too. The problem with the productive skills is that pure knowledge on the topic is not enough. Any oral or written utterance should be delivered in a logical way, served in a formal language. 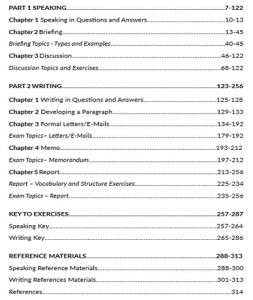 That book will teach you, step-by-step, what is the required, proper way of composing your report, memo, letter, briefing, etc. For those, who lack occasions for practising English in military environment it might be indispensable. If your knowledge was based on the movies (however, great thing to do), yet you can fail at the exam where different speaking or writing style is required. So forget “Blackhawk Down” or any other theatrical classics, and reach for the book to learn how to get your message through in an official, usually high ranking officers’ environment. Few people know that during exam not only your level of English is assessed. Actually, at the exam, they evaluate your communicative skills expressed in English. And that book will teach you that! You will realize that it takes something more to pass than a simple grammatically correct sentence. You will learn how to conduct discussions, how to support your arguments, how to convince your interlocutors, etc. Generally speaking, how to become a successful speaker and writer. The book does not limit to proper composition of your utterance. 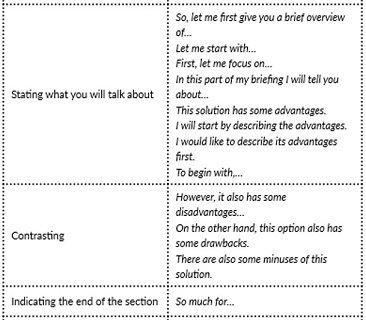 It offers you also some tips and guidance on how to prepare and successfully, efficiently learn new ideas in English. As an English teacher I immediately recognized some of them as a core message I was sending to my students too. So you will receive all the wisdom of some practitioners and tutors comprised in the price of the book. available at: http://www.stanagexpert.com – the author’s website. So far no other medium of selling was announced. No e-book available either. If you counted on a complete course book, this book is not for you. It was not the author’s intention to provide a complete course in English. Instead, you receive a complete guide in the preparation process for the exam. I believe that the basic assumption was that you already mastered a certain level of English and you need only some tuning, polishing, and switching into the exam mode. That is why you will not find any grammar pages, but you will find extensive lexical tables with useful phrases and ready-to-use scripts. Unfortunately, no CD/DVD is attached to this text book so no audio is available. Even though you still have sample briefings and discussions required at the exam. If you prefer to read something on a computer screen, this time you must stick to a paper book and rely on the pages provided. You cannot print out specific pages, but making a photocopy is still an option. The whole book is copying friendly, unlike modern course books saturated with skilfully arranged colours to blur the content on a copy. Yes, the big publishers do that on purpose! To sum up, I believe that book is absolutely indispensable for any military student, unless something new, more elaborated appears on the market! With such a scarcity of specialised resources on the market, this book has gone far beyond the readers’ expectations. It will familiarize you with STANAG6001 requirements, scoring criteria, and help you develop your productive skills: speaking and writing. It is the first such a comprehensive book preparing for the military language exams. The skills are presented in an easy and step-by-step way. 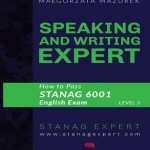 Multiple examples, ready-to-use samples, cheat sheets and comments – all that you need if you are serious about taking the STANAG 6001 English exam. Armed with that book, you are really “combat ready,” at least when it comes to linguistic battles. I have already included this position in my list of recommended books. Enjoy reading. This entry was posted in Reviews, Speaking, Writing and tagged books, briefings, exam strategies, level 3, poziom 3, SLP 3333, speaking, speaking topics, SPJ 3333, writing samples on 02/23/2017 by Paweł Jasiński. An English teacher with military educational background and experience. A self-appointed Polish translator of the NATO regulations. A serviceman in active duty. An enthusiast of SEO phenomena and a web browsers explorer.